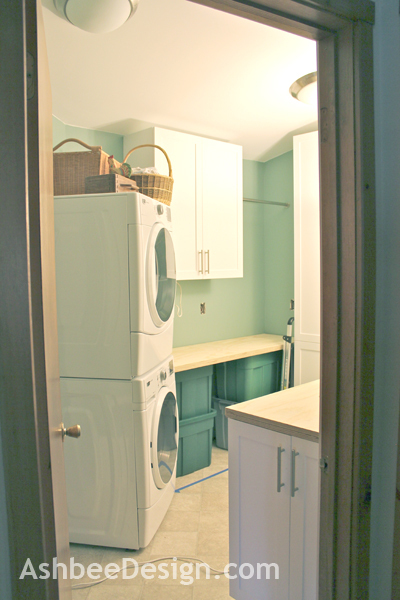 Since our contractor vanished we decided to finish up this laundry room project ourselves. Step one was building counters and adhering laminate to them. This is a job that is relatively easy if you know a trick or two. And a simple Google search will connect you to sites with instructions. Here is what we did after we reviewed the online advice. We decided to make the counters out of a double layer of A/C plywood. 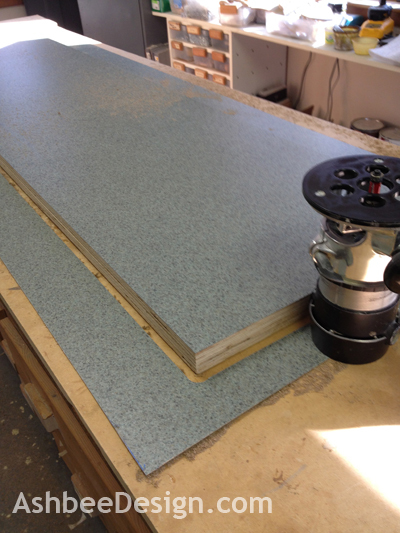 Online source recommended MDF and the local lumberyard recommended particle board. We have a section that spans about 48" that I don't want to put and additional column under. We choose to spend a little more for base material because of the span. Step 1 was to glue and screw the plywood together. We used regular yellow wood glue and sheet rock screws. Step 2 was to cut out the actual counters. We did this with a combination of skill saw and hand saw work. 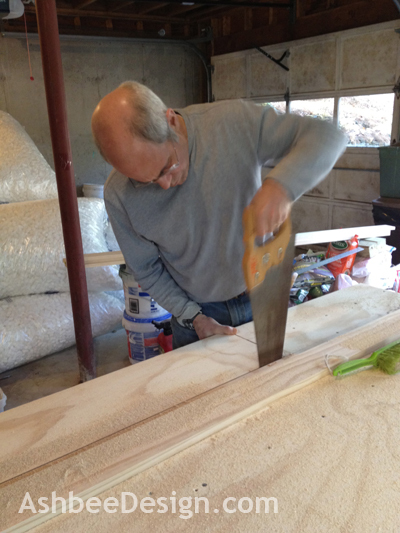 We clamped wooden boards to guide the skill saw in straight lines. We then placed the counters temporarily in place. I balanced the folding counter on storage tubs to understand how it would fit. One change I made was to make the counter a few inches thinner to allow for storage space for the stool. Lots of high storage in this room and I am short! Have you played with the panoramic option on your iPhone yet? David took this following shot using that technique. It gives you an idea of the layout. Keep in mind that the only light source I have is a floor lamp in the center of the floor. Finish electrical work can't be completed until the counters and final cabinetry is in. Makes photography a challenge. We moved the countertops to David's studio to apply the laminate. The temperatures had dropped outside and the glue requires warmth for 72 hours. Laminate is attached using contact cement. You apply it to both the wood and the backside of the laminate then let it dry for 20 minutes. (Run outside and breath in fresh air while waiting. Contact cement stinks!) 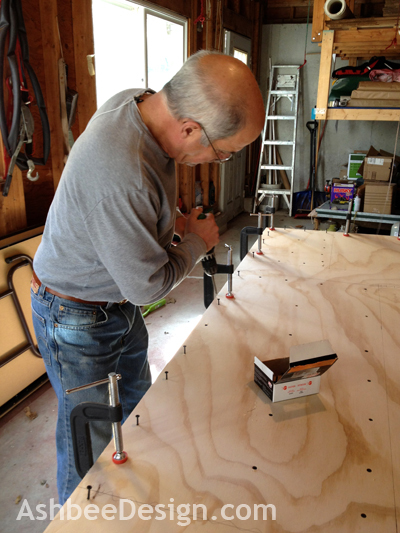 The trick we learned is to place dowels all along the counter base once the glue is dry. You then place the laminate on top. 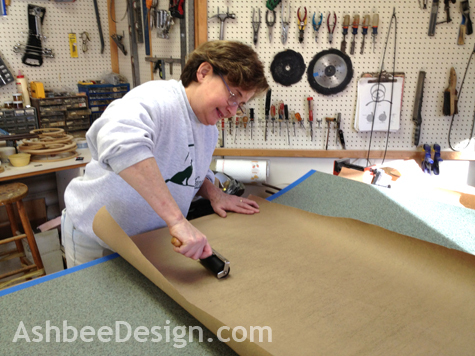 Pull out the center dowel allowing the two surfaces to touch in the middle. Using a roller, apply about 25 lbs of pressure on the area now touching. 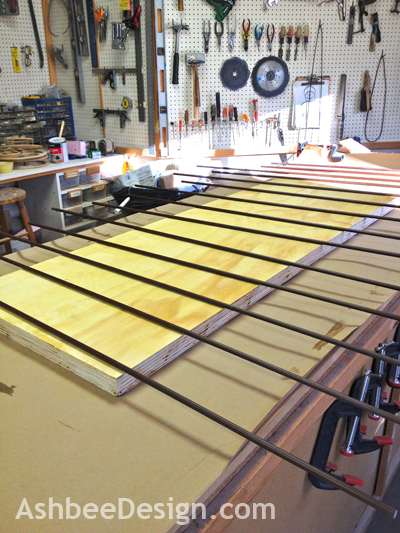 Pull out the next dowel and repeat. Continue doing this working from the center to the ends. Once done your laminate will be firmly attached with no air bubbles. Works like a charm. 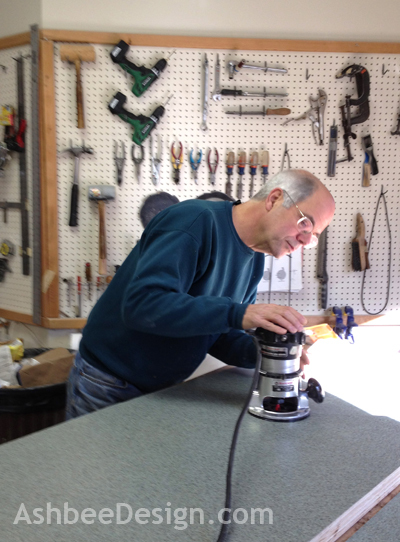 We purchased a router bit for edge trimming laminate and David cut the material to fit. We didn't apple laminate to the edges because I want a white wood trim there. (Still on the to-do list)! And then we brought the counters back to the laundry room and again put them in place to get idea of how the room will look. 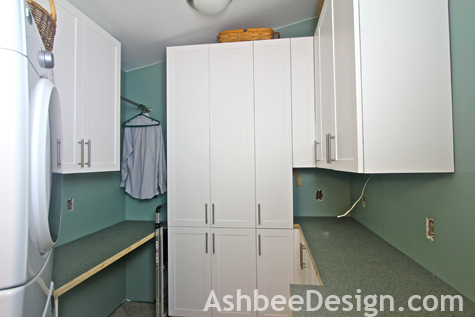 Washer, dryer and folding table on the left, extra counter space for organizing when I entertain on the right and storage EVERYWHERE! Finishing installation of the last of the cabinets is next on the list- which gets shorter everyday!